One of the most exciting events for roofers in the Puget Sound takes place today, Friday the 22nd, 2019: the RCAW Annual Trade Show. 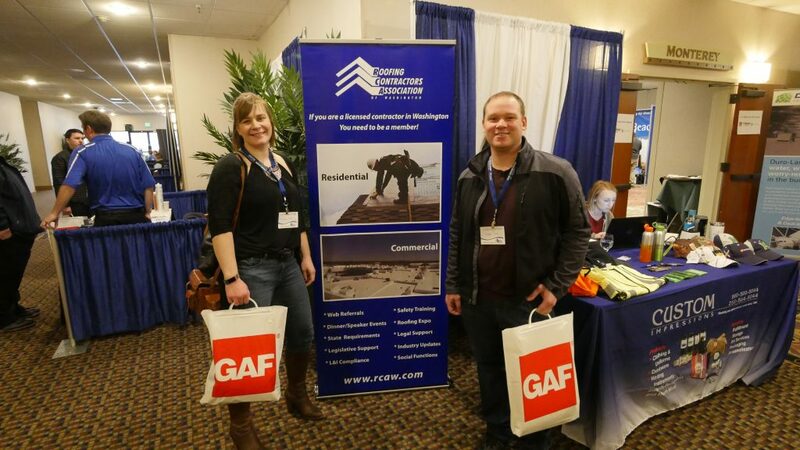 Each year, the Roofing Contractors Association of Washington (RCAW) holds an exciting and informative event that you don’t want to miss. Many roofing vendors connect to discuss cutting edge products, innovative new services, and industry techniques. Last year, classes included a host of topics, including fall safety, best roofing practices, and condensation in roofing systems. GAF Timbrcrest Ridge Cap unveiling? Could this bullnose SBS-modified ridge cap shingle be the new best-choice accessory for Timberline HD roofing system? It looks thicker, heavier, wider, and with a more appealing overlap. We’re really looking forward to learning more at the 2019 RCAW trade show! Stay tuned for the comprehensive description after the event! We anticipate meeting our many friends in the industry and learning a ton. Join us for this awesome event!